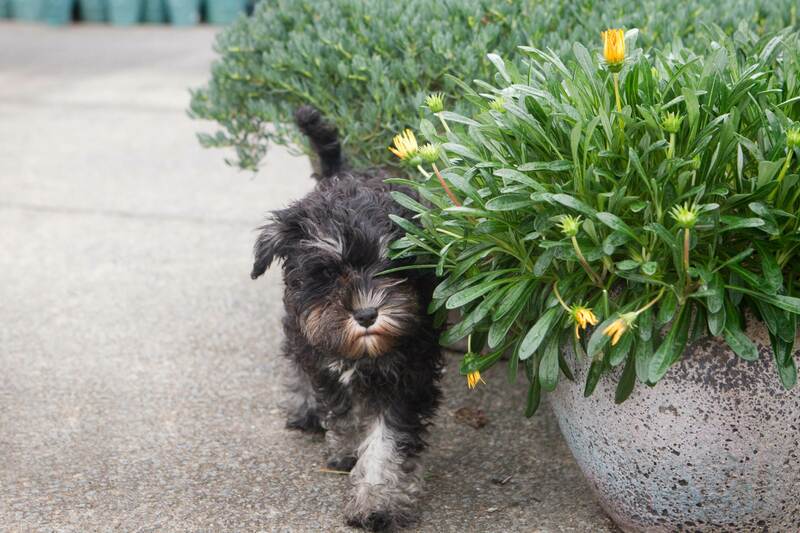 Recently, I was introduced to our new work mascot, a miniature Schnauzer named Hugo. Not surprisingly, he has embraced his tailor-made role with much enthusiasm; proving a big hit with customers, suppliers and staff alike. But integrating an inquisitive puppy into a plant nursery isn’t without its challenges; essentially, nibbles, sniffs and boisterous curiosity with plants, some of which, it seems, are murderers and irritants cleverly disguised as bark, leaves, flowers and fruit. With this in mind I decided to delve below the backyard canopy and expose the dangers lurking within the garden. The list of problematic plants is extensive so I recommend doing a Google search and referring to a number of sites in order to create an exhaustive database for yourself. Nevertheless, there exist a few standout plants and categories of plants that demand special mention in this article. Many a dreamy-eyed romantic has fallen prey to the lures of a beautiful form and an intoxicating scent and it seems that same allure is just as perilous in the garden. Exhibiting both fine looks and a sweet smelling perfume, Brunsfelsia or Yesterday, Today and Tomorrow, is an assassin, especially when fruiting. Lilies and other bulbs, such as daffodils, tulips, hyacinth and freesias are also known to cause nasty digestive problems, organ damage or failure, and in some cases even death. Other flowers such as chrysanthemums, cyclamen, begonia and gypsophila or Baby’s Breath will cause gastrointestinal upset, whilst the rather attractive shrubs azalea, oleander (Nerium) and the Euphorbia genus, especially poinsettia and the climber Stephanotis (Madagascar Jasmine) also have nauseous affects. Added to this list, are shade-loving plants such as the philodendron genus and hosta. Within the veggie patch owners must beware of tomato, potato and pea (seeds, as well) plants, mushrooms (although these should not be out in the blazing sun), onions and rhubarb, along with apricot, avocado and macadamia trees and their associated fruit/kernels. The list of dangerous indoor plants seems endless so it is best to simply keep your house greenery out of reach of family pets. Interestingly many weeds, apart from being unwelcomed squatters in our gardens, are also dangerous to our pets. Wandering jew will cause an allergic reaction in almost all dogs. Milkweed and morning glory initiate gastrointestinal upset and in the case of morning glory can also cause hallucinations. Lantana, which is registered, as a Weed of National Significance, is poisonous to many animals, so should be removed from the garden (refer to National Guidelines before attempting this task). Unfortunately it’s not just plants that pose a threat to animals; fertilisers, pesticides, fungicides, insecticides and herbicides as well as cocoa mulch are likewise hazardous. Blood and bone can upset the stomach and can result in iron toxicity. Additionally, the bone meal can clump in the intestine and cause a blockage. Poisons intended to exterminate pests and disease don’t differentiate between much loved and hideously loathed so extends the same treatment to whatever it encounters. Taken collectively protecting our pets from the evils lurking in the garden seems an impossible task, yet in reality pets and plants generally seems to coexist quite cordially. Having said that, none of us want to risk being the exception to the rule. Thus, educating oneself on what is in your yard will be invaluable in the event of a poisoning or allergic incident, as knowledge is the key to an accurate diagnosis and treatment. So survey your garden, and become acquainted with your plants: take photos, identify the plants and develop a reference. As ingestion of plants and garden products elicits the most dangerous symptoms, training from an early age is paramount. Teaching our dogs to eat by command or only what is given will eliminate a significant proportion of trouble. Fencing off or removing particularly dangerous plants is a certain fix, provided all reminisce of them is destroyed. Storing poisons, fertilisers, soil and mulch in secure areas or containers and cleaning thoroughly after they’ve been used is another help. Keeping the lawn and garden well maintained will decrease the number of weeds and pests, such as mosquitoes, midges, cane toads, vermin and snakes, which in turn will lessen the need for baits and decreases the likelihood of dogs being bitten or spat on. Our yards, gardens, parks and outdoor spaces are a sensory feast for our pets, as well as the ideal arena for exercise; consequently we need to ensure that they can adventure happily and freely but without causing us heart failure. Thus, with consistent instruction along with responsible storage of garden products and regular yard maintenance we can open our doors to the big, wide world and confidently let our dogs explore.